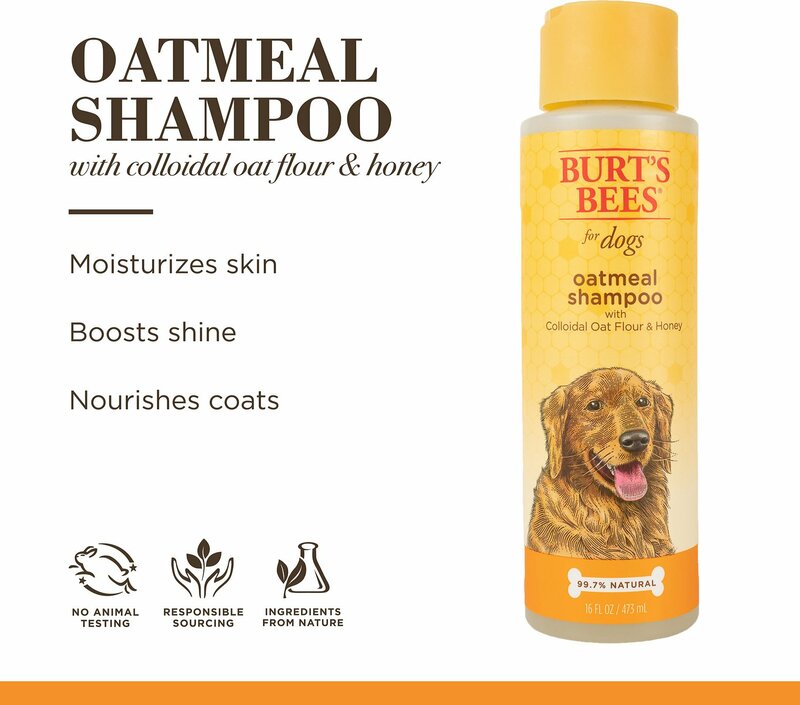 Burt’s Bees Oatmeal with Colloidal Oat Flour Dog Shampoo is made with natural ingredients like colloidal oat flour and honey for a product you can trust! 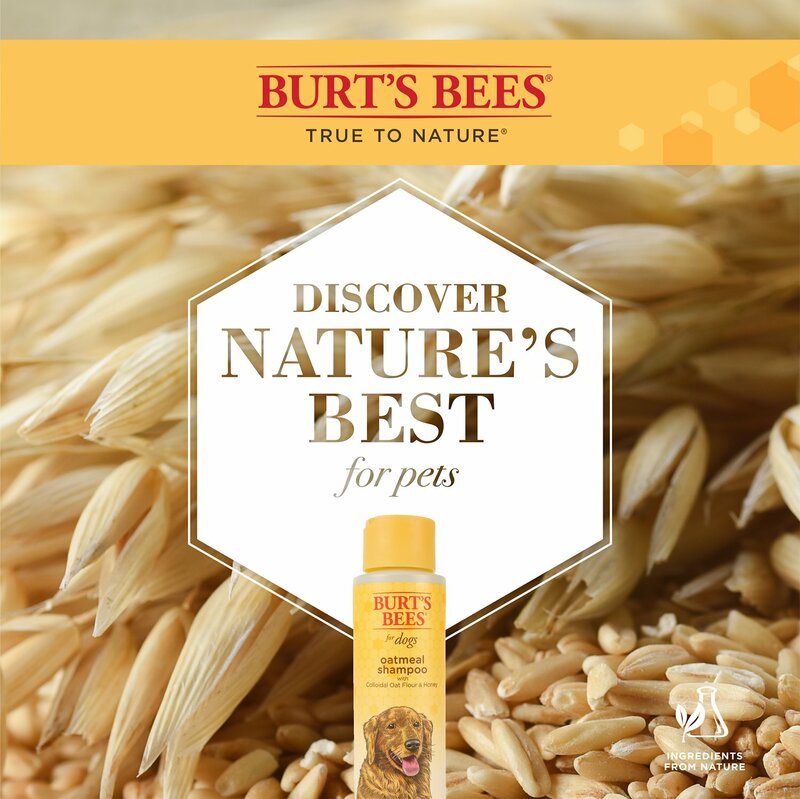 Colloidal oat flour helps to deeply condition your BFF’s dry skin, while honey promotes a shiny coat. This gentle shampoo is completely pH balanced for dogs and just like other Burt’s Bees products, it’s made in the USA without artificial fragrances, chemicals, parabens, phthalates, petrolatum or sodium lauryl sulfate (SLS). And, so your pup can stay clean and protected from pests, it won’t wash off topical flea and tick treatments when used as directed! So, give your paw-tner’s coat a deep clean with this gentle, veterinarian recommended solution that’s packaged in an 80% post-consumer recycled bottle! Gentle cleanser featuring colloidal oat flour and honey to moisturize dry skin and gives fur a super shiny appearance. Colloidal oat flour helps itchiness due to eczema and other skin irritations. Honey helps regulate and retain moisture in hair and green tea extract strengthens hair follicles for healthy growth. pH balanced formula helps prevent dry skin, which can lead to redness or flakes. 97% natural, made cruelty-free, and contains no sulfates or colorants so you can have peace of mind. 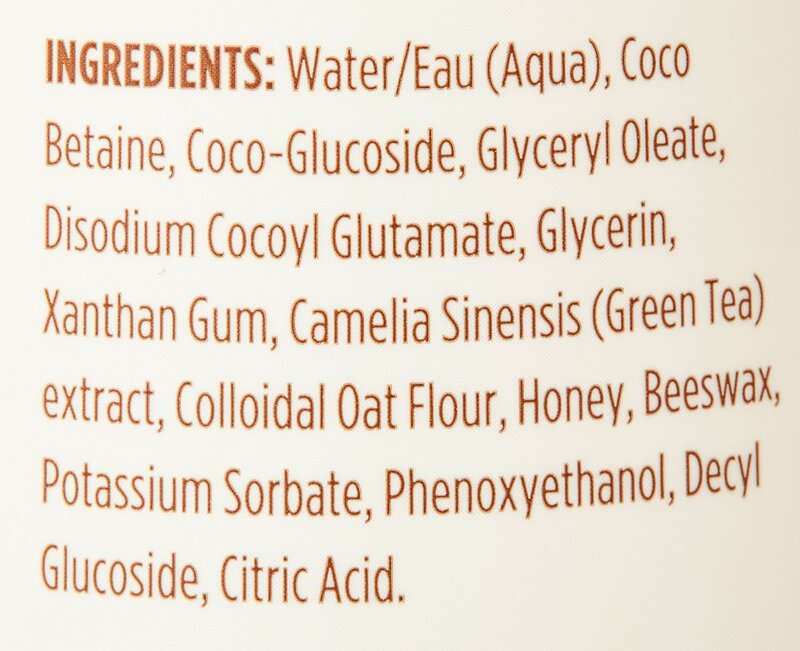 Water, Coco Betaine, Coco Glucoside, Glyceryl Oleate, Disodium Cocoyl Glutamate, Glycerin, Xanthan Gum, Camelia Sinensis (Green Tea) Extract, Colloidal Oatmeal, Honey, Beeswax, Potassium Sorbate, Sodium Benzoate. Wet your pup down then apply the shampoo from the back of his ears to his tail, carefully avoiding his eyes. Lather, rinse and have fun! If anyone thinks, "Oh, its just a dog what difference does it make if I just use my shampoo or dish soap?" They are just plan wrong. It does matter, and if your dog is getting up in years their skin can dry out. Like my little old man. This works great sooths and softens the skin and my little old man enjoyed his bath. Highly recommended. I like Burt Bee's & I LOVE my dogs, so this is why I purchased it, but I am not a fan. I tried two cycles of this with my Labradoodle, and I got nowhere. I had to switch to another shampoo. It did not lather much, it did not clean, and it did not smell nice. We have a boxer pup who needs a lot of baths due to making accidents in crate. He has sensitive skin that would sometimes get flaky with certain foods or cold weather. This does not bother his skin at all. It makes him nice and shiny. Even when we've had to do multiple baths in 1 week he had no dry flakes. I always put coconut oil on him after his bath for extra shine and protection as well! My dog has really sensitive skin, and this is the only stuff I've found so far with no harsh smells and it doesn't make her scratch and break out. The shipping was faster than expected, it didnt break the bank, and I'm overall happy with my purchase. Definitely would reccomend. I use this on my puppy who used to get dandruff a lot. Ever since we started his fur has been shiny and smooth and no more dandruff! People always comment on how great his fur looks! He scratches a lot less and I can tell he feels better too. Our Boston Terrier has severe allergies (to literally everything). She will itch so bad that she bleeds under her arms and behind her ears. We have used this product twice now and it seems to help her a lot. Every time she her skin starts getting red and she is scratching, we bath her with this shampoo and also spray her with the Burt's Bees Itch Relief spray. I have always liked the quality of Burt's Bee. This shampoo is good for sensitive skin and with Chewy's great price? I know where I'll be buying it from now on.